Wir berichten über den Fall eines 26-jährigen Patienten mit rezidivierendem Erbrechen und Kopfschmerzen bei zerebraler Tuberkulose. In der Computertomographie des Thorax zeigten sich bilaterale disseminierte feinnoduläre Lungeninfiltrate und eine Kaverne mit Anschluss an das Bronchialsystem. Die kraniale Magnetresonanztomographie zeigte multiple Mikroabszesse supra- und infratentoriell mit begleitender Meningitis. In Sputum, bronchoalveolärer Lavage und Liquor ließ sich Mycobacterium tuberculosis nachweisen. 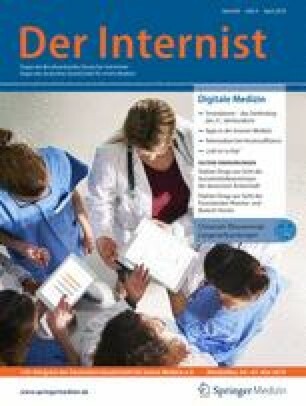 Der Patient erhielt eine antituberkulöse Vierfachtherapie einschließlich Streptomycin (statt Ethambutol) sowie zusätzlich Prednisolon. This article reports the case of a 26-year-old male patient with recurrent emesis and headache due to central nervous system tuberculosis. The thoracic computed tomography showed bilateral disseminated pulmonary micronodular infiltrates and a cavern connecting to the bronchial system. The cranial magnetic resonance imaging showed multiple supratentorial and infratentorial microabscesses with concomitant meningitis. Mycobacterium tuberculosis was detected in sputum, bronchoalveolar lavage and cerebrospinal fluid. The patient received first-line antituberculous drug treatment, including streptomycin (instead of ethambutol) and adjuvant prednisolone. M. Heinemann, J. Galaski, A.‑K. Mager, H. Ittrich, M.M. Addo und S. Jordan geben an, dass kein Interessenkonflikt besteht.